Los Angeles parking-meter fees are likely to remain a contentious issue for awhile now, especially considering the City Council's decision Tuesday to request a study that will take three months to prepare, though that may be just long enough for something else to come along and distract us before any changes result. Although a good argument can be made about the beneficial deterrent effects of higher-priced curbside parking � specifically the increased motivation for commuters to carpool � that wasn't the reason the city hiked the fees last year. Rather, the fee hike provided a source of much-needed revenue, and that's a much bigger problem that isn't about to go away. 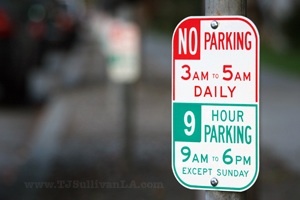 No one who expects to be taken seriously in this discussion would be so foolish as to suggest parking ought to be free. And, maybe 25 cents was too little to charge per hour in any part of the city. But taking rates as high as $4 an hour in some areas, in addition to increasing the hours of operation in both the morning and evening, is definitely too much too fast. Many drivers and business owners have already complained, and more are certain to do the same in the coming weeks. At some point, we're going to have to ask whether this is parking skulduggery because, once the dollars start to flow into city coffers, the meter-revenue claim is sure to smack of bureaucratic doublespeak. As the source of the increased revenue is revealed we'll see that they really meant "meter-maid revenue." We can already guess from whence a lot of this money will come, not in quarters from the meters, but rather from the checks we'll all write to pay the parking citations we'll find tucked beneath the windshield wipers on our cars. And that doesn't seem fair, or just. Many drivers won't notice that the meter fees have changed. Nor will it register that the hours of operation stated on the sign have been altered. They'll pump that quarter into the meter like always expecting to get an hour in return, or they'll park thinking the space is free after 6 p.m., like it's always been ... until now ... and the cost of that education will be the fine stated on the ticket. Who parks at the meters? It's not the Lincoln Town Cars with chauffeurs at the wheel. It's the rest of us. It's part-time students at UCLA who are taking just one class and can't afford a parking pass. It's people using the Central Library downtown, where the parking garage used to be reasonably priced, but now can cost as much as $9 for three hours, and another $4 for every 10 minutes after that, up to $36.50! It would be one thing if LA had the public transportation system of San Francisco, or New York, but we don't. For some trips, the bus makes sense, but for most of us, it's just not practical. We have to drive to get where we need to go in the time that we have to get there. For the City Council to now be asking for a study about all of this is completely backwards, and, because it was the council who approved this in the first place, I can't help but assume that the study is merely a way to buy some time, to allow things to cool, because for a matter such as this, three months is longer than the limits of the public attention span. * I talked about this issue on KCRW's 'Which Way, LA? with host Warren Olney and Donald Shoup, a professor of urban planning at UCLA: DOWNLOAD LINK.